The Frederiksberg problem - Easy to Solve! A lot of great Tableau enthusiasts has encountered the famous Frederiksberg problem, when building filled Municipality maps of Denmark. The problem arise since the Copenhagen Municipality vector is covering the data and vector for the Municipality Frederiksberg. Earlier the solution was found by connecting to an external file with Municipality polygons. BUT thanks to Tableau, the Frederiksberg problem has now got an easier solution. It is actually not even a problem anymore! 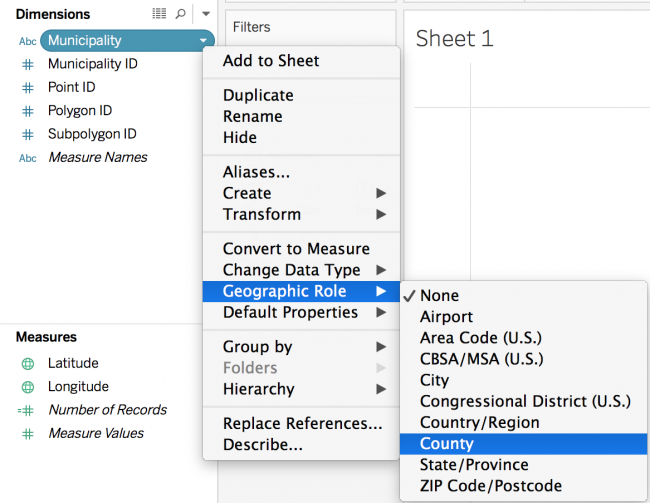 Since version 9.3 Tableau, supports postal code data for 39 countries including Denmark, it's now very easy to create filled maps of Denmark. So now to the big question - how do you do?? If you have a field containing the 98 Municipalities of Denmark you just need to assign it the geographic role County as shown in the picture below. Now you can double click on your "new" geographic field and choose it to be shown as a filled map in "show me". This will give you a view like the one below, were Frederiksberg is no longer hidden by Copenhagen.